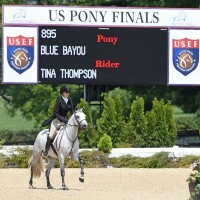 At this year's US Pony Finals, names with Blue in them are by far the most popular. Photo by Kimberly Loushin. Ponies are known for being a unique subset of the equine species. Beyond their pintsized feet and their penchant for naughtiness, there’s a plethora of names that are perfect for our shorter equine companions. Some are a sign of the times (Snapchat isn’t a name you would have seen a few years ago) and others reference times gone by, such as Mr. Magoo (Do kids even know that reference?). Regardless, pony names tend to be more unique than some of their larger counterparts. Here are some of our favorites, by theme. What are your favorites? Share with us! Are We Sure That’s a Children’s Pony?